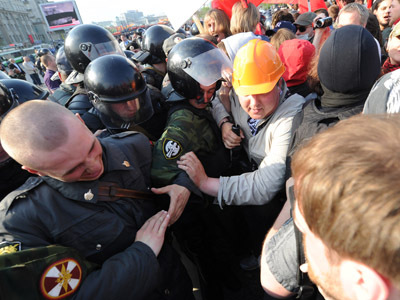 Police officers drag away activist on Bolotnaya Square on May 6. Russian authorities have opened a criminal case over the alleged beating of a pregnant woman by police at Sunday’s anti-government protest. Video posted on YouTube records the event, although some suggest the victim was actually a young man. ­The video released on Thursday caused public outcry at the behavior of police during the Moscow rally, with opposition members demanding an investigation. The footage shows an activist being restrained by several officers and then kicked in the stomach and the leg by another officer.The victim was participating in the “March of Millions” rally in Bolotnaya Square on May 6, which triggered a series of further protests, leading to the arrest of over 400 people. Sparking controversy among press and political opposition alike, the video was branded a recording of a police attack on a pregnant woman. 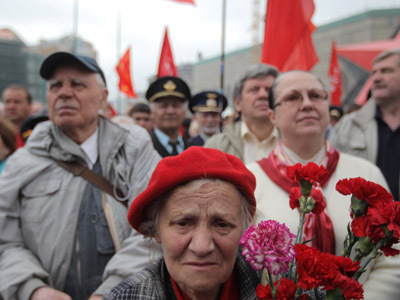 Members of the Communist Party immediately demanded a criminal case be opened against the police officers in the video. “We have uploaded the footage onto our website. The footage clearly shows how police kick the pregnant woman in the legs and stomach during the protest in Bolotnaya Square,” said secretary of the Communist Party Sergey Obukhov. A user on a Russian blog site has questioned the validity of the video and whether the victim is actually a woman. Additional video and screenshots paint a different picture, showing footage from after the incident where the victim is more clearly visible. Upon closer scrutiny the blogger suggests that it is not a pregnant woman in the video but an adolescent boy. A probe was immediately launched by the authorities to identify the officers in the video and police have appealed to the victim and any witnesses that might have seen the incident to come forward. "Measures will be taken to identify the policemen who used violence against the girl," Vladimir Markin of the Russian Investigative Committee said to press on Thursday. After conducting a check on all personnel that had been stationed in the square, Moscow police have denied any of their officers were in the video. They suggest the officers featured came from outside the capital. 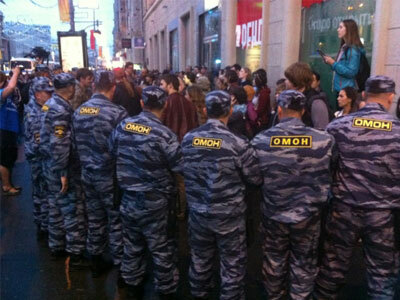 Extra officers were drafted into Moscow from the surrounding regions to deal with swelling numbers during the protests. Over 8,000 demonstrators clashed with police in Sunday’s “March of Millions” anti-government protest. Tensions heightened as some threw projectiles at police and tried to break through officer lines to get to the Kremlin. There have also been reports of an activist throwing a Molotov cocktail into the crowd. Twenty police were reportedly injured during the clashes while 17 protesters asked for medical assistance. Key opposition figures Sergey Udaltsov, Boris Nemtsov and Aleksey Navalny were arrested on charges of insubordination to authorities as they tried to address protesters.